Want an El Dorado Seaside Resort Map? | Sunset Travel Inc.
Home » News » Want an El Dorado Seaside Resort Map? Want an El Dorado Seaside Resort Map? Here is a copy of the El Dorado Seaside (Sensimar which is the older section) resort map that they give you when you check-in. The ‘New Seaside’ does not have a resort map, or a resort info PDF available yet. But Karisma tells us it will arrive any day now. We were just at the New Seaside for an awards ceremony and it is absolutely stunning….They took everything they have learned and created a showcase. Want to take a copy with you? Click on this map….and download or print a copy that travels. 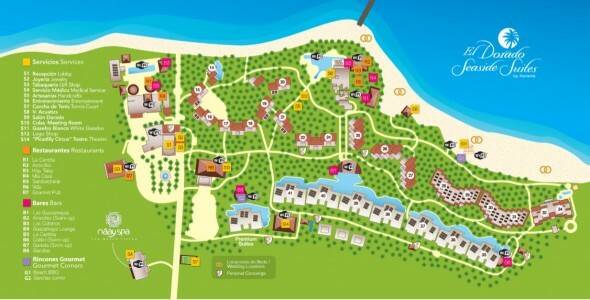 If the Resort Map does not answer your question, click on the ‘Ask Me’ button. Or if you’re checking prices…..let her send you a quick quote. Sarah only sells Karisma Resorts (Azul, El Dorado & Generations) ….all day…every day. We are very proud of her! She has won Top Sales every year since 2008 when she started selling Karisma Resorts. Since 1976 - We are Licensed, Bonded, Insured, and maintain rigorous financial, personnel, and business standards as required by the Airlines Reporting Corporation. © 1976 - 2019 Sunset Travel Inc.. All rights reserved. We cannot be responsible for the timeliness or accuracy of the information. Please see our Terms & Conditions for more information regarding the use of this website.